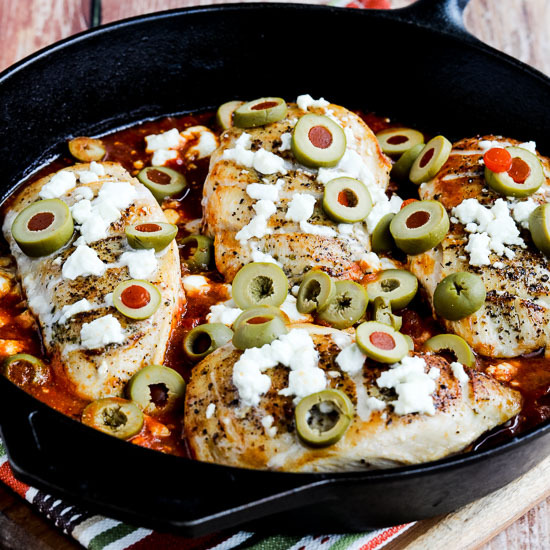 One Pan Low-Carb Greek Skillet Chicken is a delicious and easy main dish that’s low-carb, Keto, low-glycemic, gluten-free, and South Beach Diet friendly. Use the Diet-Type Index to find more recipes like this one. 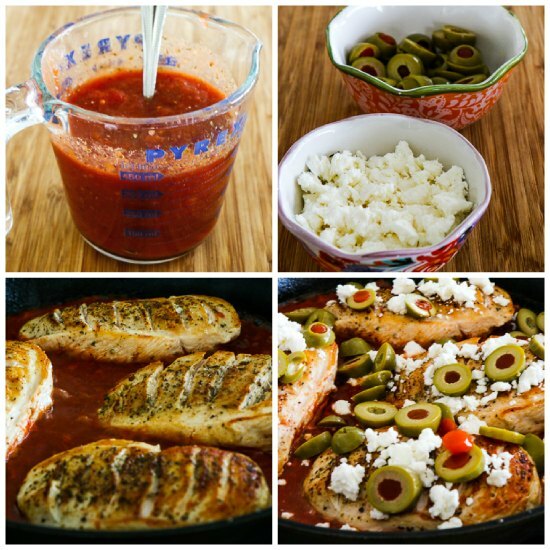 Click here to PIN One Pan Low-Carb Greek Skillet Chicken! 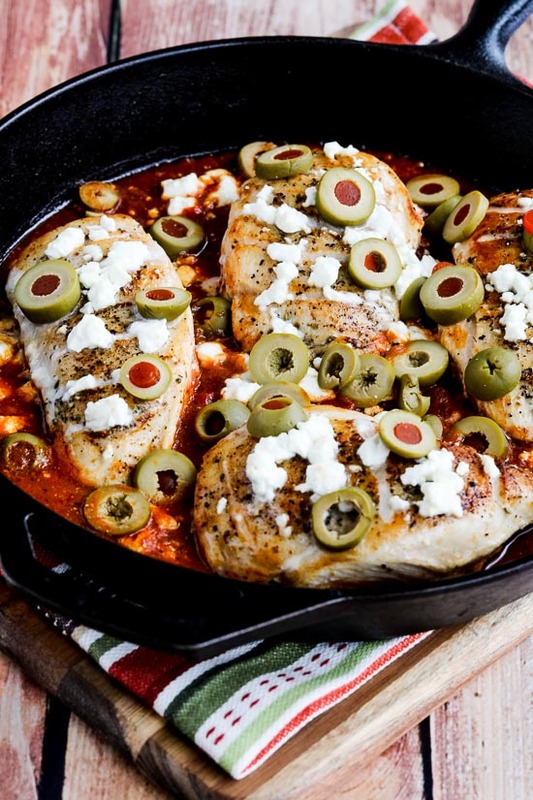 One Pan Low-Carb Greek Skillet Chicken! People often ask me where I get the ideas for the recipes that end up on Kalyn’s Kitchen, and they do come from a variety of sources. But for this One Pan Low-Carb Greek Skillet Chicken I just woke up one day with the recipe idea in my head, and the next time I cooked with Jake we tried it out and loved the result. It did take two tries to perfect the recipe so it was good enough to share with you. The second time we used my trick that creates Perfect Grilled Chicken Breasts to cut little crosswise slits in the chicken for more even cooking, and we also mixed spices into the petite diced tomatoes for a bit more Greek flavor. But seriously, this recipe is so easy and quick you could definitely make it on a work night if you have some chicken thawed out in the fridge. Jake and I are both huge green olive fans, as you can tell, but if you’re not fond of that bitter taste, you could skip them or use regular black olives or sliced peperoncini instead. But whether you use the olives or not, this is just so good; hope you enjoy it as much as we did! Preheat oven to 400F/200C. Trim the chicken and make small crosswise slits, being careful not to cut too deep. Rub chicken with Greek Seasoning and season with salt and fresh-ground black pepper. Heat oil in a 12-inch cast-iron skillet and brown chicken 4-5 minutes on the top side. Turn over and cook 2-3 minutes more on the second side. While chicken cooks mix the petite diced tomatoes, 1 tsp. Greek Seasoning and garlic powder. Crumble the Feta and slice the green olives. After chicken has cooked a few minutes on the second side, spoon the tomato mixture around the chicken pieces, lower heat, and simmer about 5 minutes more. 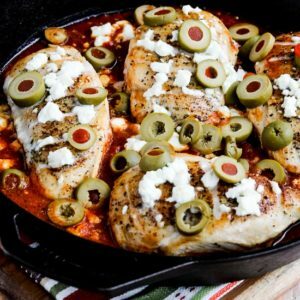 Top chicken with the crumbled Feta and sliced green olives, put the skillet into the oven, and cook about 10-12 minutes more, or until the Feta is melted and chicken tests at 165F/75C with an instant-read meat thermometer. We used extra large chicken breasts (about 8 oz. each) to be sure the chicken didn’t get too dry, so if you’re using smaller chicken breasts the cooking time will definitely be less. Serve hot and enjoy! 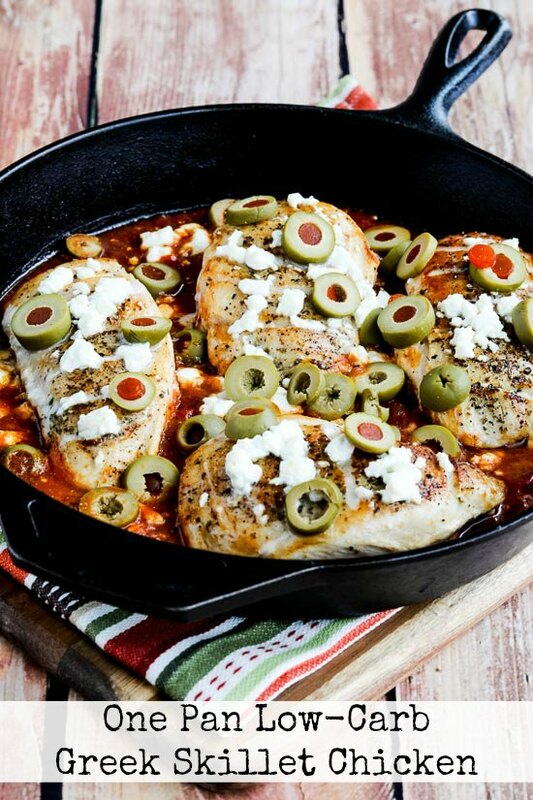 One Pan Low-Carb Greek Skillet Chicken is a delicious and easy main dish. 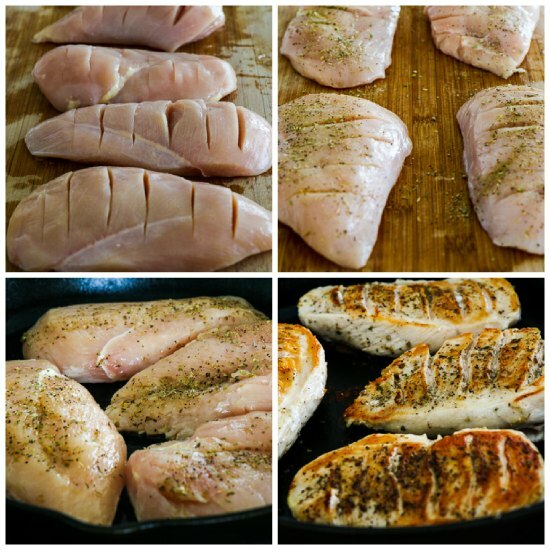 Trim fat and any undesirable parts from chicken breasts, then cut small crosswise slits going down each breast, taking care not to cut too deep. Rub the chicken with the 2 tsp. Greek Seasoning and season with a little salt and fresh ground black pepper. Heat the olive oil in a 12-inch cast iron skillet, or another frying pan that can go in the oven. When oil is hot, add the chicken top side down and cook over medium heat for 4-5 minutes, or until the top of the chicken is nicely browned. Turn over and cook 2-3 minutes more on the second side. While chicken cooks, mix the petite diced tomatoes plus juice, 1 tsp. Greek Seasoning, and garlic powder. Crumble the Feta and slice the olives. When chicken has cooked a few minutes on the second side, spoon the tomato mixture around the chicken pieces, doing it carefully so the top of the chicken is sticking out of the sauce. Turn heat to medium low and simmer about 4-5 minutes more. Turn off heat and sprinkle Feta and green olives over the chicken. We used a 12-inch cast-iron skillet for this recipe. You will need a frying pan that can go in the oven if you don’t have cast iron. An instant-read meat thermometer is helpful for telling when the chicken is done. Recipe created by Kalyn and Jake, from an idea that Kalyn woke up with one day! This One Pan Low-Carb Greek Skillet Chicken is perfect for low-carb or Keto diets, and it’s also low-glycemic and great for any phase of the South Beach Diet.